Not too long ago, a friend of mine posted something intriguing on Facebook. She thanked all her “non-chameleon” friends who were the same no matter what company they held. I found this to be very thought-provoking. I’m sure you can think of a few people who are chameleons. They act one way with a certain group of people, but are completely different with another group. They “change their color,” so to speak, to fit their environment. Now, to a minor extent we all do this. Most of us would probably be more subdued visiting an elderly relative in a nursing home than we would be at, say, a wedding reception. But that’s just two different sides of your personality- the caring, listening side and the fun-loving, have-a-good-time side. You’re still being yourself in both situations. But I ask you to consider another facet of your life and ask whether or not you’re a chameleon in this aspect- your faith. Like it or not, most of us would probably have to admit that it’s all too easy to be a chameleon when it comes to our Christian faith. After all, we don’t want to “offend” people. Church is a safe environment to vocalize our faith and speak boldly our statement of belief in the Apostles’ Creed. At church, surrounded by other Christians, we sing loudly and joyfully. At church it’s easy to profess our faith. There’s no fear of others mocking us or rolling their eyes at how “religious” we are. But once we leave those doors, it’s another story. The world is a scary, daunting place. So we often find ourselves mumbling a quick prayer at a restaurant after glancing around to make sure no one is watching, slipping into the vernacular of swearing at our workplace, or skipping over church when others ask us what our weekend plans include. But after a while that takes its toll. If you can’t live your faith everywhere, why bother? If you slip into the “neutral” color long enough, you find yourself staying there. It becomes easier to skip the mealtime prayer altogether, and after a while those Sunday morning invitations from co-workers start to look pretty tempting. 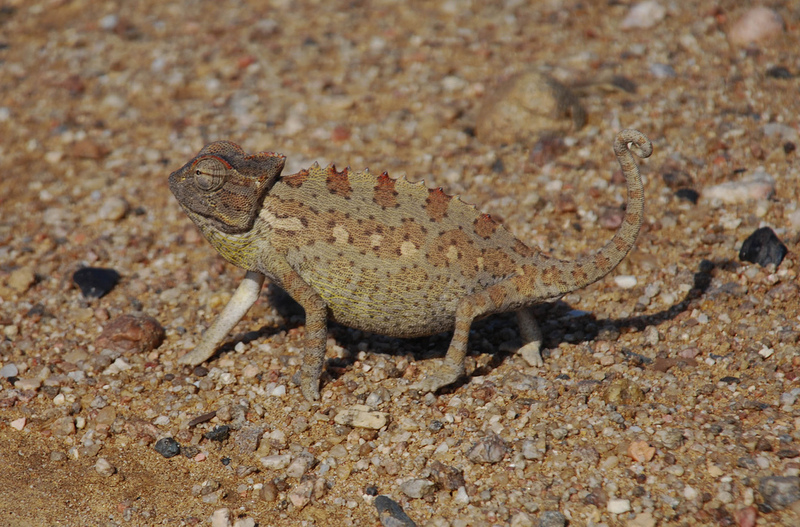 Be aware of the times in your life when you set aside your Christianity to become a neutral chameleon. So what can be done? First of all, realize something- Christianity is not nearly as off-putting to most people as some would have us believe. On the contrary, I’ve found that most people are actually pretty open to talking about religion, even when they don’t agree with you. Yes, there are those vocal few who would chase you off their property with a shotgun if you dared to invite them to church, but they truly are a minority. We had a neighbor once who was a staunch non-believer. He made that very clear. Yet we had more conversations with him about Jesus than I’ve probably even had with some fellow Christians. We would explain to him why we believed in Jesus, and he would listen very patiently and respond with his questions and doubts, but it was always incredibly cordial. He never got mad at us for “forcing” our beliefs on him. In fact, he was often the one who initiated these conversations. To our knowledge, he never did come to saving faith, but that’s not for us to know. We Christians don’t need to “keep score” and see how many people we can convince. No, that’s the work of the Holy Spirit, and all we can do is plant the seed when opportunities arise. Let me give a few other examples to back my claim that Christianity isn’t so off-putting. Recently I had the opportunity to go around our neighborhood door-to-door to invite kids to a Bible day camp our church is sponsoring this summer. I was scared to death at first, believe me. Going door-to-door is not a terribly Lutheran thing to do, and it really isn’t something that comes naturally to me. But once I started, I found it wasn’t so terrible. Sure, there were people who weren’t interested. There were those who smiled and nodded politely though it was clear they had no interest in church whatsoever. But there were also a few surprises. One of our neighbors, a friendly guy who has always chatted with us, told us that he’d had a falling out with his denomination some years back. He was surprisingly open about it and didn’t seem at all offended that we invited him to our church. Another lady actually thanked us for the opportunity to send her kids to the Bible day camp, and told me she had been looking for a way to teach her kids the Bible. She doesn’t know much about it herself, and has been thinking about church for a while but never really got around to it. Her kids were the first to sign up, and who knows how the Holy Spirit will work in that family? Dear ones, there’s no need to be a chameleon when it comes to your faith. Wear those colors boldly and proudly. Chameleons are amazing in their ability to change color. Searching for pictures, I found chameleons that were brown, green, blue, green with vivid red stripes, teal with red spots, bright red, and some that were so multi-colored there was no dominant color. But the brown ones are boring. They don’t catch the eye like the vividly striped or multi-colored ones do. Don’t try to blend in and remain unnoticed. The good news of Jesus is far too exciting not to share. Christians should be different. People should be able to tell that you’re a Christian no matter your surroundings. Stand out. Wear your colors proudly. You never know who needs to notice.